Magical Properties: Lust, Passion, Desire, Extreme Sexual Stimulant! Prominent Notes: Vanilla, Amber, Patchouli, Cinnamon, Dark Sugars, Woods, Resins. For years I was reluctant to re-release this formula. This is in fact, a close duplication of my very first Love Potion® recipe, that worked so well, it was absolutely scary. For the final version, I chose to temper it to a "safer" level...adding more ingredients for respectful and cherishing love, rather than pure animal attraction. Eventually I could no longer ignore the multitude of requests to bring this version back. I did so, but still added some tiny notes for gentle sweetness and protection to assuage my conscience. 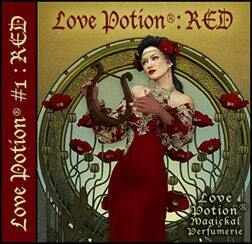 By popular demand, Love Potion®: RED is now a part of our permanent collection. I certainly understand the attraction to the idea of a perfume potion that drives men insensible with lust, but I do not exaggerate when I say that the wearer should absolutely wear this fragrance with caution. I would not, for example, wear this out for a night on the town with the girls. I wouldn't walk alone while wearing it, either. This is best reserved for a night with your own beloved, or the specific person you want to seduce. I relate this to you from personal experience. When I was first creating Love Potion®, I tested each adjustment by wearing it around for a week or more. With the original version of this, I had three very unnerving scary days in a row, where different men stalked me down the street, at my shop, and as I went about my day. Not the kind of guys one dreams of attracting, mind you, but the hungry wolf-ish predator types, that look like they are waiting for the opportune moment to grab you and drag you into an alley. I don't mean to frighten you, but I hope I make my point. This potion is not to be used with a frivolous attitude. I believe my addition of ingredients for gentleness and protection has smoothed some of the dangerous edges off of this potion, but it still tends to inspire a rather extreme sexual response in men, so please wear it with caution. VANILLA ~ Extraordinary aphrodisiac, inspires happiness, playfulness, sexual arousal, lust, and is physically vitalizing, familial sense memories, soothing, nurturing, comforting. AMBER ~ Fertility, luck, riches, sensuality. PATCHOULI ~ Soothes and uplifts, sensual, sexually stimulating, lust, fertility, money. DARK SUGARS ~ Attracts love, luck, sweetness, riches, lust inducing. NOTE: Although well diluted, this potion contains cinnamon essential oil which can be irritating to the skin. Do not use in the vicinity of the eye or other mucous membranes. Discontinue use if sensitivity occurs. Love Potion®: RED is a part of our Permanent Collection. Packaged in an Italian glass roll on bottle, with attractive label as pictured.